How to install adblock in BlackBerry Z3? In this article you will find the tutorial for installing AdBlock in your BlackBerry Z3 smartphone. I have provided the AdBlock configuration steps with the help of screenshots. Read the below article to find out how to install and configure AdBlock in BlackBerry Z3. BlackBerry Z3 has got an excellent browser with flash support. The bad part is most of the pop-ups and ads run on flash. A single pop-up in a webpage can spoil your browsing experience. You can completely avoid this by installing AdBlocker. 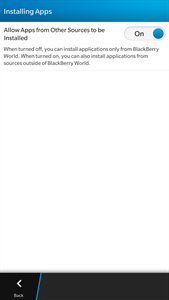 Unfortunately there is no AdBlocker app in BlackBerry world. Even though there is no app for BlackBerry world, you can install AdBlocker apk file as it supports Android apps. Isn't it great? Here comes the challenging part. Installing Android app in BlackBerry Z3 is easier than you can imagine but configuration is a little tricky. In this article I will give you tutorial for installing and configuring Adblock in BlackBerry Z3 with screenshots wherever required. From your BlackBerry phone open browser and search for Adblock plus or get it directly by giving the link in the address bar as https://www.adblockplus.org. By default it shows as "Install for Safari". To install for Android click on the Android robot image and you will now get "Install for Android". If you click on it a new webpage will open showing "Download for Android". After clicking on it, your phone asks for the location to save. You can just click the 'Save' option which you will find in the right corner of the screen. This save option will download the Adblock plus apk file in your phone storage. After download gets completed you can click on the downloaded apk file to install. During installation if it throws any error message follow below step. BlackBerry by default won't allow you install from third party vendors. You need to explicitly enable in setting to install app from sources other than BlackBerry world. To enable installation from third party sources: Open Settings -> App Manager -> Installing Apps. Here you need to turn on the 'Allow Apps from Other Sources to be Installed'. If you are not sure whether you are turned on or turned off refer below image. AdBlock app will work only if you change the port as 2020. To configure, open Wi-Fi in settings. Connect to your Wi-Fi network. Once connected, your Wi-Fi name (SSID) will be listed under 'Connected to'. Now long tap on it and it will shows option to edit the connection (pencil button). It will open your current Wi-Fi settings. Scroll down to enable 'Use Proxy'. 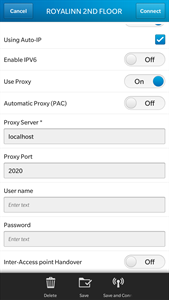 It will show a form like Proxy Server, Proxy Port after enabling it. In Proxy Server form type localhost and in Proxy port type 2020. Refer the below screen shot. Now click on save and connect. Remember, to block ads you need to keep running the AdBlock plus app in the background. Don't close the app, if you close you will be getting ads and pop-ups while browsing. Note: This tutorial works for all BlackBerry 10 smartphones.